Editor’s Note: In this article originally published by our allies at the Life Extension Advocacy Foundation (LEAF), Mr. Nicola Bagalà provides a poignant discussion of the suffering associated with the diseases of old age, for which contemporary geriatric medicine can only offer palliative treatments but no lasting solutions. It is imperative to correct this situation by advocating for the advancement of effective rejuvenation treatments which can not only successfully cure the diseases of old age but also reverse biological aging itself. Some time ago, I noticed a stock photo of an old lady seeing her geriatrician, who was a much younger woman. Nothing special was happening in the picture, which showed just two people talking; however, it made me wonder what it must feel like to be an elderly person consulting a geriatrician. One initial assumption could be that it isn’t much different than seeing a GP, but that seems unlikely. If you are seeing a GP, the odds are your disease or ailment is not debilitating, let alone life-threatening. Whatever it might be, you went to see your doctor knowing that, most likely, he or she would be able to cure you; especially if you are young, it’s probable that just taking a medicine for some time, or doing physical therapy, will make you better. You know that you will recover, and the discomfort or the suffering you’re going through is destined to go away. You will get back to your life as it used to be, healthy as ever. Things are rather different when you are seeing a geriatrician. 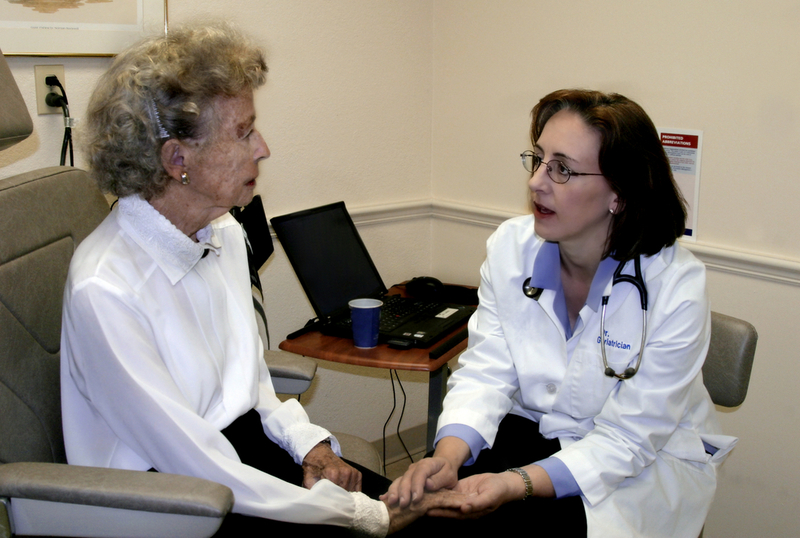 A geriatrician is a specialist who takes care of the needs of elderly patients, an activity that can be summarized as ensuring the highest possible life quality of a patient in spite of his or her failing body, which becomes increasingly less resilient and less able to respond to treatment with the passing of time. Existing drugs and exercise programs, for example, can ameliorate the symptoms that an elderly person experiences and improve his or her life quality, but the vast majority of age-related diseases simply cannot be cured right now. When you go to see a geriatrician, you do so with the knowledge that your doctor will most likely be unable to make you any better, despite his or her best efforts; you simply can’t shovel water with a pitchfork. You are aware that, as you keep aging, your condition is likely to worsen, and all your doctor will be able to do is help you manage your symptoms. You know that you are not going to get back to your life as it used to be and that you are not going to be as healthy as ever—that’s not what old people generally are like. In fact, one day, one of the conditions that brought you to see a geriatrician in the first place is going to worsen to the point that you will die of it. Most of us are familiar with the feeling of going to see a general practitioner, getting a prescription for some mild ailment, and going back home, thinking about our plans for the rest of the day or the week, which possibly involve a big project that we have been working on for a while and can’t wait to take to completion. What if, instead, you are going home after seeing a geriatrician because of osteoarthritis in your knees? Whatever you might be thinking then, you probably are distracted by the pain that you feel in your knees with every step you take, and the thought that it’s not really going to ever improve doesn’t make it any better. It is unlikely that you have any big project going on that you are looking forward to finishing; it’s not that you wouldn’t like to have one, but your deteriorating health makes it difficult to do anything too demanding. Probably, your much younger doctor is going to go back home thinking about an exciting upcoming trip or her next night out, but you are not. It’s impossible not to wonder what it must feel like to watch others get back to their own lives from within your own failing shell, knowing that the life that you are getting back to is likely going to be short and decreasing in quality; to hear your doctor say that your ailments can be managed, but not cured; to know that, as time passes, you are more and more likely to lose your independence and cause problems or suffering for your loved ones. Putting on a smile and trying to look at the bright side of things may help you cope and avoid making things worse than they have to be, but it’s not going to make them better either. A positive attitude is a great prescription for any disease you might have, regardless of your age, but it is not the only prescription that you would be given for any serious illness that might strike you before old age. There is no reason why staying positive and palliative care should be the only medicines against aging—not now that rejuvenation biotechnology is becoming an ever-more concrete prospect. People of all ages should have the right to go to see their doctors knowing that, most probably, whatever diseases they have may be cured; that any others they might get in the future can be prevented; that their discomfort or suffering is going to go away; and that they are going to get back to their lives as they used to be, healthy as ever.